And for us and for our salvation he came down from heaven, was incarnate from the Holy Spirit and the Virgin Mary, and was made man. He came to make His blessings flow, far as the curse is found. St. John Chrysostom tells us, to “consider how great it was to hear and learn that God, the indescribable, the imperishable, the unfathomable, the invisible, the incomprehensible … He who surpasses every mind and overcomes every thought, who surpasses angels, archangels, all the spiritual powers above, He undertook to become a man, and to receive the flesh which was formed from earth and clay. The Creed reminds us that he came down for our salvation. He came to redeem us from our sins and deliver us from the power of the evil one. St. Athanasius emphasizes that just as the world was created in and through the Son, the world must be redeemed in and through the Son. Salvation includes not only the idea of redemption from sin, but the freedom to enter into the communion of love between Father, Son, and Spirit. Years ago, Amy Grant sang, “Love has come for the world to know.” In one sense this captures a big idea among many church fathers. Many of the Fathers acknowledge he has come down for this love, this great communion. We focus on the glorious mystery unveiled in the birth of Jesus, the unveiling of God’s image and love for all to see, to know, to participate in. In today’s Gospel, we see the hand of God preparing a place for the coming of the Son. The revealing of love unbound in the binding of a little babe. In our reading, we meet Caesar, Joseph and Mary, the Inn, the Shepherds, and a host of Angels. 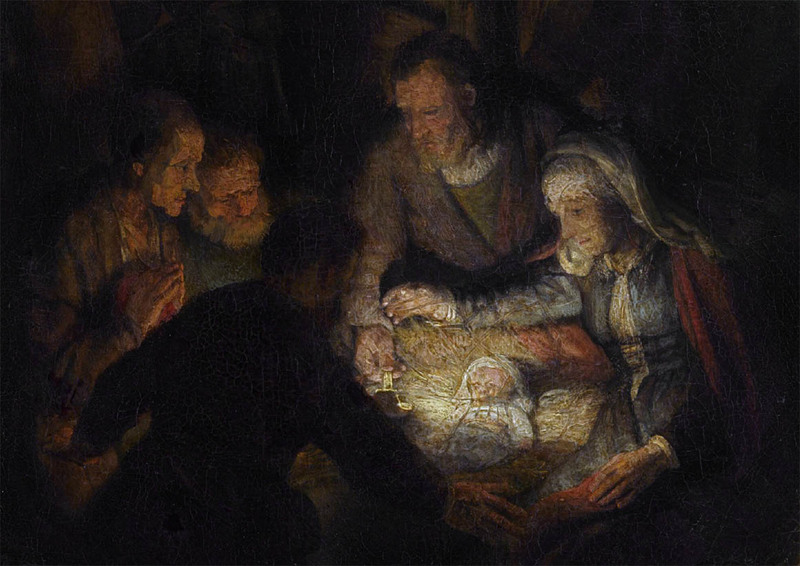 The birth of Jesus is not a timeless tale teaching ageless truths. It is an event in the history of the world at a specific place and time. Luke mentions the Caesar and the Governor. Under Caesar’s rule, the whole world, the ecumene, has been united under one rule. The Caesar was considered the Prince of Peace. He was called the Savior of the world. An inscription from 9 BC says that the day of the Emperor’s birth “gave the whole world a new aspect. It would have fallen into ruin had not a widespread well-being shone forth through him, the one now born … Providence, which has ordered all things, filled this man with virtue that he might benefit mankind, sending him as a Saviour (sõtẽr) both for us and our descendants … The birthday of the god was the beginning of the good tidings that he brought for the world. From his birth, a new reckoning of time must begin” Caesar could never fulfill this role, but he is part of the mystery of God’s unfolding plan. And the roads of Rome lead to and from Bethlehem. For they will eventually become the highway to bring the Good News of this King, Lord, Savior, and Prince of Peace to be declared all across the empire. In this brief story, we see how the hand of God has been and continues to be working in people and events that are often at odds with His ultimate rule. This world was created to reveal the Father’s love in every mountain and every valley, in the sun and moon, in the seas and rivers, in the cold and chill, in the dew and rain, in the fire and heat. all the birds of the air and beasts of the field were created to bless the Lord, revealing His love in every moment and every movement. In turning away from the Lord, humans could no longer see or hear this grand symphony of creation. They planted cities of violence and cultures of oppression. Nonetheless, his purposes cannot be thwarted. The prophets reveal the unseen hand of God at work in every nation in the rising and falling of rulers, and in the hope that pulses in the human heart. In the fullness of time, He will bring all things in subjection to His Son, Jesus the Christ. Joseph has already heard the word of promise and assurance from the angel who speaks in his dreams. 23 “Behold, the virgin shall conceive and bear a son, and they shall call his name Immanuel” (which means, God with us). 24 When Joseph woke from sleep, he did as the angel of the Lord commanded him: he took his wife, 25 but knew her not until she had given birth to a son. And he called his name Jesus. (Mt 1:20–25). Now as they heed the call of Caesar to be registered, they follow the call of the Father into Bethlehem, the city of David, the birthplace of the King of all Kings. Luke tells us that when the time came for her to give birth there was no room in the inn, so she gave birth to her firstborn son and laid him in a manger. We usually focus on the innkeeper providing no room. But actually there was no room in the world. John tells us that He came to his own, and his own people did not receive him. (Jn 1:11). The human world in rebellion and blindness could not grasp, contain, hold, or even welcome the true source of all power. There is simply no room for Him in all creation. He is greater than all existence, and yet He came down. [T]hough he was in the form of God, did not count equality with God a thing to be grasped, 7 but emptied himself, by taking the form of a servant, being born in the likeness of men. (Php 2:6–7). He humbled Himself under the mighty hand of the Father, who would lift Him up in due time. His humbling birth foreshadows His humbling death. Birth and death bound together in the perfect image of Love. Mary places the baby in a manger, a feeding trough. St. Maximus says that, “In the manger, where the food of animals is placed, he allowed his limbs to be laid, thereby showing that his own body would be the eternal food of men.” He is the bread from heaven. The Father gives you the true bread from heaven. 33 For the bread of God is he who comes down from heaven and gives life to the world.” (Jn 6:32–33). The shepherds watch over their flock in the dark. Half spent was the night. The whole world lies in darkness. “Long lay the world in sin and error pining.” The shepherds remind us of our Advent journey. We’ve been watching and waiting in darkness. Like the five wise virgins, the shepherds are watching, are alert as they watch their sheep in the dark. Into the dark, a light shines. O night divine. The angel of the Lord appears and glory shone around. Bringing good news of great joy to these weary shepherds, The angel proclaims, “For unto you is born this day in the city of David a Savior, who is Christ the Lord.” Lk 2:10–11. The King has come. He came down. For us and for our salvation, He came down. Suddenly the darkness gives way to unfurling light as a host of angels, praise God saying, “Glory to God in the highest, and on earth peace among those with whom he is pleased!” (Lk 2:14). The Lord is pleased to reveal His love, His peace, His shalom in His world. He is pleased to heal and restore and lead He people into love. The shepherds make haste to behold that which the Lord has made known. They behold Mary, Joseph, and Jesus, the Lamb of God. They behold that which the Lord has done. The shepherds become the first evangelists of this good news. Luke writes, “And when they saw it, they made known the saying that had been told them concerning this child.” (Lk 2:16–17). They behold the glory of God in Jesus and become living witnesses of the work of God. To behold the love of God in Christ is to be transformed by that same love. The Son of God came down to reveal the Love of God, to restore our eyes and ears and hearts, so that we might behold Him in all His glory, that we might know His love. 16 that according to the riches of his glory he may grant us to be strengthened with power through his Spirit in our inner being, 17 so that Christ may dwell in our hearts through faith—that we, being rooted and grounded in love, 18 may have strength to comprehend with all the saints what is the breadth and length and height and depth, 19 and to know the love of Christ that surpasses knowledge, that we may be filled with all the fullness of God. (Eph 3:16–19). He came down that a deluge of love might drown us all. Like Mary, we must pause, behold and treasure these things our hearts. And like the shepherds our response to such good news of great joy is to glorify and praise God for all that we have seen and heard in coming of the Son God, in our Savior Jesus Christ. In the child who would be the King who pour out His life even to the point of death, death on the cross. He would descend into our humanity that He might raise our humanity up into the Love of Father, Son, and Holy Spirit. And finally, like the angels, we go forth as flaming messengers with the love of God burning in our hearts and the word of Grace burning in our lips. May we reveal the Good News of His coming and redeeming in all we say and do.